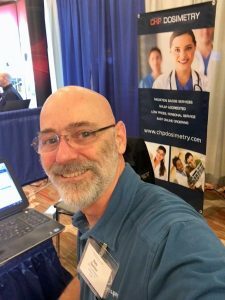 Think about all the time you spend performing radiation surveys and in the end don’t have any actual data to show for all that work. Counts.Pro effortlessly records every moment of any survey. Along with the output of the meter, you get GPS position, time start and stop, the measurement in quarter second intervals, operator, probe, meter, etc. Everything you need to fully document surveys. 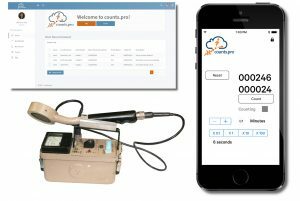 Counts.Pro is a bit of hardware, a free iOS App (search “countspro” in the Apple store), and a cloud storage solution that allows you to record all your radiation measurements with all the associated documentation entered by the user. You can save your surveys to our cloud server and share them immediately with a supervisor or anyone with access. You can also send the file by email, or store it on your iPhone/iPad/iPod for later downloading. Meters get obsolete, but Counts.Pro gets better every time we update the Free App, or you upgrade your phone. I hope February is good to all of you. Those of you who are member of the Health Physics Society, we hope to see you in Cleveland ROCKS!